Not That He Agrees, But Piers Morgan GETS IT: "Brexit Vote Should Leave Hillary Shaking in Her Boots"
Regardless of what you think of Trump’s inflammatory rhetoric, and his uncompromising talk of walls and bans, does anybody really doubt after this shock Brexit result that he’s right about the levels of anger? It may not be obvious to the political and media elites living in their hallowed, protected homes in privileged areas. But travel to the north of England, or to the middle of America, and you will find very real fury with government and very real concern over the impact of perceived immigration control failures. There’s an increasing large gulf between the politically correct ‘cool’ and ‘establishment’ crowd who view any publicly stated concern about border controls as ‘racism’, and those who have to live at the sharp end of it. The clear message from this sensational day for any politician or world leader is this: ignore the concerns of the people at your peril. Britain’s Prime Minister Cameron assumed, arrogantly and patronisingly, that he would win this referendum by relying on the tried and tested vote-winning issue of the economy. But he seriously misjudged the mood of the nation. In fact, it was immigration and ‘getting our country back’ which won it for the Brexiters. Donald Trump is currently behind Hillary Clinton in most presidency polls, betting odds and Wall Street opinion – but so was the Leave camp for much of the EU campaign. What none of the UK pollsters, bookmakers and city experts realised was there was a huge groundswell of anger which was going to tip the balance away from their presumed favourite. I don’t endorse Trump for president, not least because of his stance on guns. But this bombshell Brexit result should send a shudder down the spine of Hillary Clinton and all U.S. Democrats. If it can happen in Britain, it can most definitely happen in America. One of the best comments from readers to Cameron's threat of WW III if Brexit: "Fernando Rosado: Pretty sure thats now in the works. After Brexit WW3 is now the only way to usher in a one world government. The climate change myth is not enough. They need a war, a BIG war." "The clear message from this sensational day for any politician or world leader is this: ignore the concerns of the people at your peril." That is why the EU is trying to remove the component of voters from the whole ruling and just get a full blown dictatorship going. Even France finally gets it. You may remember a few years back a rogue trader with one of the biggest French banks went on a gambling spree, lost them some 5 Billion Euro with unauthorised trades and nearly put them into bankruptcy. He was jailed for about three years and ordered - big joke of course- to repay. He got out of jail and promptly decided to sue his ole bank - for unjust dismissal. The highest European court have agreed wiyh him and awarded him half million in damages. THIS IS NOT A JOKE. I guess that Piers Morgan is brighter than I thought!! What a great day this is. But a lot more needs to be done. And assassinations could put a stop to the endeavor. 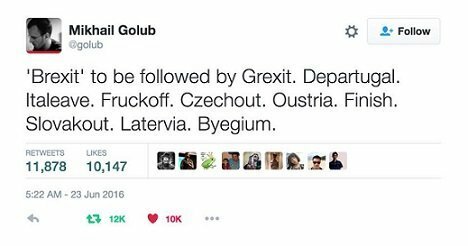 "Czechout" literally made me laugh out loud. "I guess that Piers Morgan is brighter than I thought!!" Naw. He's just a stupid guy who has spent his life shaking in his boots. "Fernando Rosado: Pretty sure thats now in the works. After Brexit WW3 is now the only way to usher in a one world government. The climate change myth is not enough. They need a war, a BIG war."